This page introduces you to the equinITy Monitoring Device and explains how the device functions during typical operation. 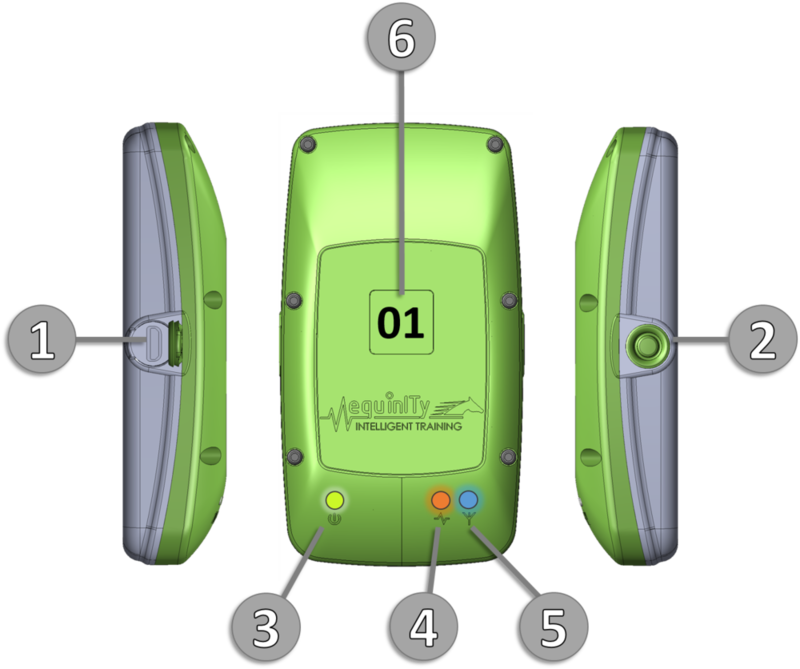 The device records to its flash memory (local) once a GPS lock is acquired and movement is detected (09.00 on the illustration). The action of the horse breathing with the device attached is sufficient to trigger local recording i.e. the horse can be stood still. The entire session from tack on to tack off is always recorded (until 10.00). Streaming works differently in order to reduce mobile data requirements and costs. This illustration highlights how and where streaming begins and ends during typical operation. Streaming is activated when the horse reaches the "Start" condition, which by default is 8 mph for 5 seconds (at 09.28). When the horse slows and achieves the "Stop" condition (which by default is 7 mph for 4 minutes), the streaming ends (at 09.39). This window of time allows you to monitor the recovery of the horse for a suitable length of time. If another exercise happens before the Stop condition has been satisfied, streaming continues without interruption and after the final piece of exercise, once the stop condition has been satisfied, the streaming stops. While starting up, the green GPS LED is not flashing, what should I do? GPS reception is likely impaired by nearby buildings/objects. Leave the device outside with clear line of sight to the sky and after a short while, it will obtain a lock. While starting up, the blue GSM LED is flashing and not turning solid, what should I do? GSM coverage is likely poor. Firstly, try power-cycling the device. If this fails, move the device to another nearby location where a GSM signal may be stronger. After tacking up, the amber HRM LED is not flashing, what should I do? 1) If you have more than one device, you should check if you have paired the device to a different HRM. 2) You did not wet the offside of the horse and the HRM is consequently struggling to detect a signal. The GPS/Power LED is flashing red/green, what does this mean? The battery charge is low. Simply connect your device to the USB cable and allow it to recharge. Once fully charged, the LED will turn solid green.